John Johnson is a native of Panama City, FL and has worked in financial services for more than 20 years. He holds a B.A. in history from the University of Florida, a M.S. in Financial Planning from the College of Financial Planning in Denver, CO, and has the designation of CERTIFIED FINANCIAL PLANNER™. He taught Psychology, Economics and Mathematics in the Bay County School System for 15 years. 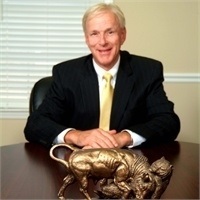 His experience in the financial world includes serving as a bank branch manager, a residential loan officer, and in the investment and financial planning services for over 20 years. John is currently a Financial Advisor with Harbor Financial Services, LLC. He is a Christian and previously served as an elder in the church. He lost his wife Lois after 43 years of marriage to cancer in April of 2014. He is married to Leah Perry Johnson and lives in Lynn Haven, FL. He has three children, two step children and seven grandchildren and one step-grandchild. When he is not at the office you can find him on the back nine where he is teaching his grandson to hit the golf ball.